We've been developing and running affiliate programmes in the personal finance sector for many years. The programmes below are tried and tested and we constantly seek ways of enhacing them. If you run websites that would benefit from dynamic personal finance programmes then sign up to these. We've operated in the Personal Finance sector since 2004. It's where we've cut our teeth and refined our business offering. It's highly competitive so we've worked hard to identify niches for personal finance programmes that have true potential and where we can offer a point of difference. We have consolidated our personal finance programmes into a single focused offering. Earn a commission of up to 6% per loan paid out with this innovative product - an unsecured loan that does not depend purely on a borrower's credit score. 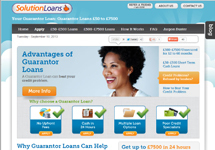 If they can provide a guarantor then our panel of lenders will be very interested in considering their application. This is a highly attractive proposition in this current tight credit market and there is strong and growing business in this sector. Commissions generated are added to your account at the start of each week with monthly payouts. There's more programme information available and you can sign up to this affiliate programme at our in-house affiliate network. Superaffiliates provide the critical mass for an effective programme.